Like most of my posts here, I’m going to try to make something sound easy, when in reality I’ve spent months crying into my coffee trying to understand it. In truth, I’ve been trying to get oAuth to work for more than a year now. My initial issue was that I didn’t want to understand oAuth, I just wanted to copy and paste some stuff and hope that it worked. I can tell you now that I’ve worked it out, it really isn’t that difficult, but knowing what’s happening will make it all much easier. 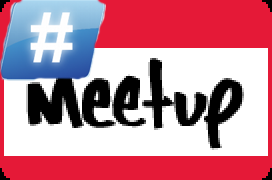 oAuth was made to solve a problem, that of sharing information between two different web services. We need oAuth because a user may want to right click a file from Dropbox.com and post it on Facebook with one click, for instance. Or have their Twitter send a Tweet when they update their Blog on WordPress. oAuth is a crucial verification step when tying two services together, and it’s worth the time to spend learning how it works. Furthermore, most of the coolest REST APIs out there require you to authenticate using oAuth in order to even use them. Now, let’s see what the steps are to get your application (or script) linked to a service that uses oAuth. oAuth isn’t too complicated. Here’s what a normal oAuth exchange looks like. This happens the first time a user links two services (or instead links PowerShell or Python to a web service) and generally is a one time thing. We’ll submit that code in exchange for an authorization token. This is a one-time thing, as most auth tokens last quite a long time. Now that we’ve got an Authorization Token, we can use this over and over to make action on behalf of our user. The last piece of info to know is that there are special URLs to use for each stage of the authorization process. For the rest of this post, assume I’m talking about WordPress.com, which requires you to use oAuth for authentication before you can start using their API. All of the code I’m referring to here can be found in the PSWordPress repo on GitHub. 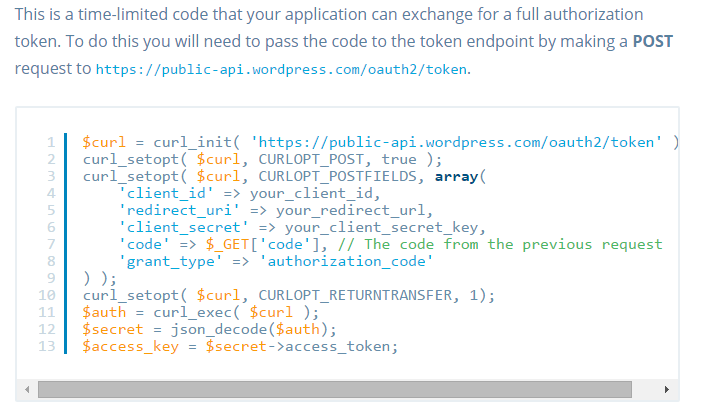 In my implementation of oAuth for WordPress, all of the following steps (except signing up for the API) are performed within the Connect-WordPress Account cmdlet, if you’d like to follow along. Any service which uses oAuth as the gateway to a REST API is going to have some mechanism in place for you to register for the API. 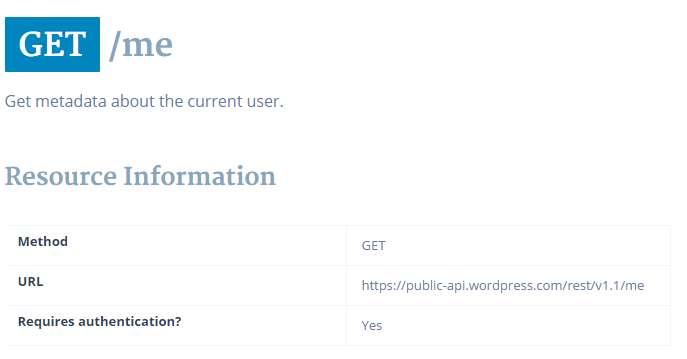 If you want to use the WordPress.com API, for instance, you’ll register for it here. Just to be clear, you’re not signing up for oAuth, rather oAuth is simply the mechanism that let’s your users trust your app or service with a bit of access to their account from something else, say, Twitter or FaceBook. Signing up for an API will normally involve you picking out a name for your project, providing a thumbnail image, and providing the URL of your application. Because the primary use case of oAuth is to allow services to talk to each other, even though we’ll be using PowerShell, we still must provide a URL. 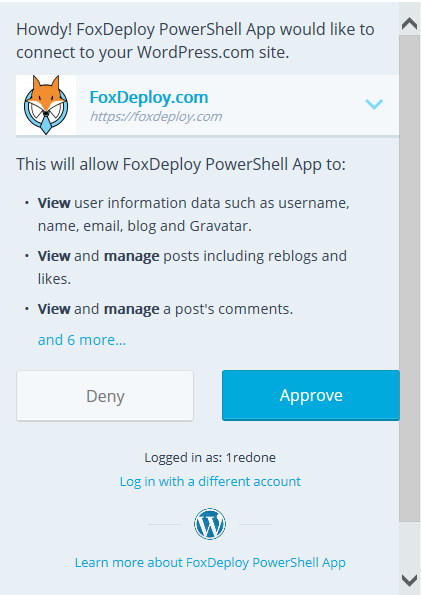 I’m using the URL of my blog, FoxDeploy.com, but you could pick literally any URL in the world. ClientID, a numerical ID WordPress assigned us. ClientSecret, a randomly generated strong password assigned to us. Generally, keep this secret. It’s not such a big deal for WordPress but some APIs will require payment, so this could be as costly as giving out a credit card number. The first real step in implementing oAuth, once you’ve got your Client details and the URLs, is to display a logon box to a user. This step is mostly prompting a user to provide you their credentials to a given service. We can grab the URL that we saw when we signed up for the API, and send the user there, providing a few values to represent your application/project, and then the user will login. When the user signs in, they’ll be redirected to the URL we specify, and the access token will be embedded at the end of the address they go to; we need to simply substring out the Access token and we’re set. 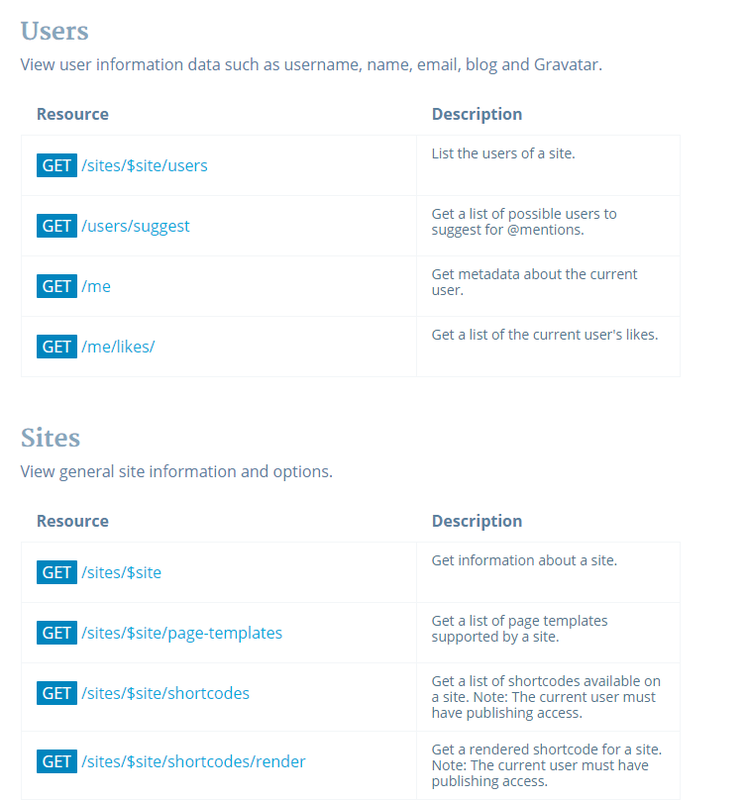 Taking a look at the oAuth page for WordPress, we see where we need to provide our values to make the login box appear. To display a login box from PowerShell, you should use the cmdlet I’ve got here, Show-oAuthWindow. In this next section, we’ll dig into what this is actually doing, so that you can swap parts in and out as needed to fit whatever you’re working on. Show-oAuthWindow is where the magic happens. I found this example on the Hey! Scripting Guy Blog, written by Microsoft PowerShell PFE (Wow, talk about my dream job!) Chris Wu. It’s really beautifully simple. 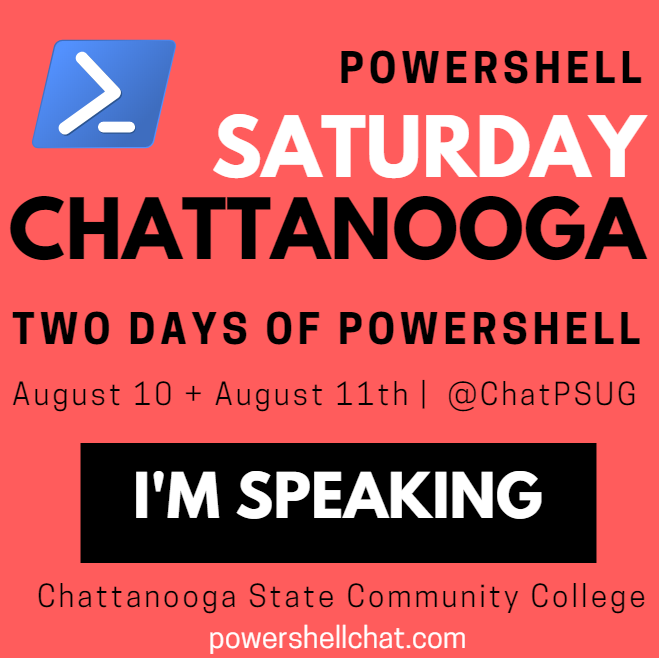 An assembly is loaded into PowerShell, to allow us to display some .net forms objects. Then the window size is specified, and we provide the URL for the browser window to go to (the ‘Authorize’ URL from my project screenshot above). We watch the process and instruct the window to close when the user is redirected to an address with Error= or code= in the URL. Assuming the user interacts with this successfully, they will be redirected to the $redirectURL, and our Access Code will be within the URL, looking something like the following: https://foxdeploy.com/?code=cw9hk1xG9k. We’ll store the address in $uri, make it a global variable and then close the window, and we’re left with a $URI value that includes our access code. We merely need to regex out the Access Code. Write-output "Received an accessCode, $accessCode"
At this point, we have the Access Code, and it’s time to cash it in for an Authorization Code. They URL listed there is actually the Token URL we saw earlier when we sign up, and tell us to do a cUrl to that URL and add our (the ClientSecret), the project ID (Client ID) and your redirect URL, along with the Access Token we just got . Take all of these, present them as the body for one last Post and we’ll get back our Auth Token. Once we’ve done this, we don’t need to repeat the steps again until our Authorization Token expires. Now, to look within Get-WordPressAuthToken, here is how to post an access code and get back a token with PowerShell, instead of the cURL example in their screen shot. We call the oAuth2/token endpoint, and just provide a list of parameters, including the Access Token we received when the user authorized our app. If this request worked, we’ll see something like the following. We simply need to take the Access Token and save it for future use. We’re done with authorizing now! The user has now trusted us to partially act on their behalf for WordPress/whatever service. This token we have is the functional equivalent to them just handing us their computer logged in, with Chrome open and signed in as them on this service. Anything you can do as a person using the service, someone with your Auth Token could do as well. This means you need to find a safe place to store it. I opted to use the secure string cmdlets to store them safely within the user’s appdata folder, so if you’re looking at my own example, I use the system security API to safely store this info. It can only be read (by default) by that user, or administrators of that PC, so it is fairly safe. When the user loads any cmdlet from my PowerShell module, the variable is reloaded into $accessToken so that all of the PowerShell cmdlets that need the token ‘just work’. According to this, I just need to query the URL listed and provide my Authorization Token as a header. Getting data back from a REST API, awesome! That’s really all there is to it! The data will come back already serialized, in most cases, and you’re in business. At this point, all you need to do to make a slue of cmdlets is to look at the endpoints, find nifty ones, and then just setup functions that ask for the right info. This is the fruit of my labors, right here. I hope you liked this post. I’m very happy to have finally worked out an approach that makes sense to me for oAuth. If you’ve got some specific requests or some REST APIs that are giving you fits, let me know and I’ll do my best to help you figure it out! Next Article Listen to me on Coding101! Been reading your blog for a while and this one totally blew my mind. This is definitely something I’m gonna try to find the time to to put into practice as oAuth is quickly becoming the de-facto standard for cross-platform authentication. I imagine there are quite a few other instances where it could be useful. I’m happy you liked it! I really needed to wrap my head around it, and I felt like others might be struggling with it too, so I wrote this! Hi, once again thank you for your blog! I’m trying to adapt this to Fitbit, but they only allow Browser authentication (so no inwindow etc). On top of that, their very vague about their URL demands. If you have any tips (on how to do a. and find/figure out b. ), that would be awesome! Share what you have so far?